From anywhere in application you can create a new meeting from the main navigation bar. Just press the “Create new” button and you can start your meeting. 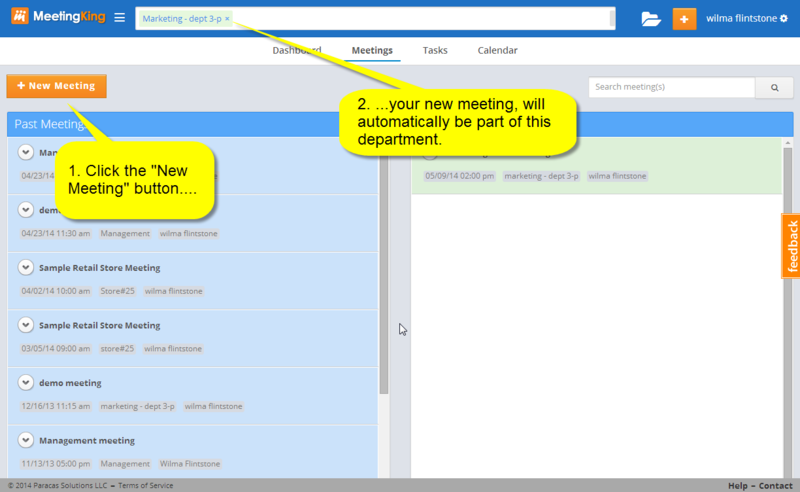 You can also create a new meeting from your Meetings overview page. This is very useful if you are managing a certain project or department and you want to create a meeting related to that project or department. When you create a meeting here the new meeting will automatically get the tags that you have listed in the Projects/tags filter. This way you have a true project view. You can also create a new follow-up meeting from an existing meeting. The title, list of participants, location and tags of your previous meeting will automatically be copied to you new meeting. In addition all your tasks from this meeting will be added to the agenda of your new meeting. You will save time and nothing will fall through the cracks. Read more on follow-up meetings. You, as organizer, will receive an email with a link to the meeting and it will show up in the list of meetings in your MeetingKing account. Now you can prepare the agenda and email the agenda with one click. Read more on how to create a meeting directly from Outlook, iCal or Google Calendar.